Yay for a pretty striped skirt! I feel so bright and happy in this outfit. 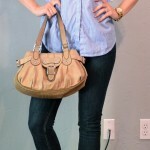 Think this is prefect for a casual Friday that transitions to a casual movie date summertime kind of day. I love a good navy striped skirt. And it pairs so nicely with the yellow. Adorable skirt! Love it with the yellow cardi!